Olympic lifting exercises, like cleans, snatches, or push press, are multi-joint exercises that work much of the body through a powerful movement. They are great for increasing explosiveness and strength in your upper and lower body. Plyometric exercises use the elastic properties of muscles to develop power through what is called the stretch-shortening cycle. The effect is very similar to what happens with a rubber band: when you stretch a rubber band, elastic energy is stored in the rubber band. When you release the rubber band, it explodes out of your hand. Your muscles can store the same type of explosive energy when performing any type of plyometric exercise. The only difference is, while the rubber band will hold that elastic energy for as long as you hold it back, the elastic energy in your muscles only reacts when the stretch-shortening cycle is performed very quickly. Take too long, and the energy stored in your muscle disappears. So, when performing plyometric exercises, like box jumps or depth jumps, your aim is to keep your contact phase (when your feet touch the ground) as short as possible and always explode out of it. Ballistic exercises use the forceful release of a weight or an object to increase power in your prime movers. Overhead medicine ball throws, for example, use a "lightweight" ball that can be thrown very quickly. Here is a list of power training exercises you can use to increase your power. Most power exercises are (intentionally) multi-joint movements. They are categorized by the type of power exercise they fit into. You should transition from the Max Strength Phase using the heavier Olympic lifting exercises before you jump to the more explosive plyometrics and ballistic exersises. Just like strength and hypertrophy training, there are some guidelines you should follow when diving in to your power training. After finishing your Max strength phase you don't want to just jump right into performing high impact plyometric exercises. When you transition from Maximum Strength to your Power phase, you can do so by beginning to add Olympic lifts into your strength training sessions. As I explained earlier, Olympic lifts use heavier weights and serve as a great way to transition from the heavier strength training to the high impact power training. After doing this for a week or two, you can then split you weight training sessions into strength and power training days, where you perform Olympic lifting on some days and strength training on others. In another week or two, you can transition totally to power and begin to add plyometric and ballistic exercises the same way. 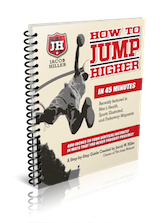 This will ensure you have a nice base of strength and power before beginning high impact plyometric training. When training for power, you need to make sure the loads you use are not so heavy that they make for slow execution of the exercise. Remember that the whole point is to be explosive, so make sure you're using loads that allow for that. This makes determing your loads for power training a bit different than for strength. When lifting for strength, a 5RM (5 repetition maximum) means that you can only perform 5 reps of the exercise. When lifting for power, a 5RM means that you can only perform 5 reps of the exercise EXPLOSIVELY. So for example you may be able to perform eight(8) reps total at 135lbs. on the jumps squat, but 135lbs. is your 5RM because you can only perform 5 of those reps at an explosive tempo. Training loads for power exercises depend on the type of exercise. If it is a single joint exercise, like ballistic hamstring or hip flexor exercises, about 30% of the 1RM (1 Repetition Maximum) is the best for peak power output. Plyometrics also fit into this category. If if is a multi-joint exercise, like a squat jump or power clean, abaout 75-90% of the 1RM is best. Remember, the whole point of power training is to develop explosive power. So, make sure that all your reps are performed explosively, i.e. at game speed. Resting periods for power are the same as the resting periods for strength: 3-5 minutes between sets, 2-3 minutes between exercises. Between training sessions, you should rest at least 48 hours. The training volume for power exercises is lower than for strength exercises: the reps are similar but loads are lighter, to make for explosive execution. For power exercises, 3-5 sets of 3-8 reps is optimal for power development. For example, if your are performing 5 reps, you could have a heavy day where your loads are true repetition maximums (5RM), a medium day where your loads are 95% of your 5RM, and a light day where your loads are 90% of your 5RM. If you split speed and footwork into two different training days (to better focus on each goal), you also have to split your weight training days because speed, footwork, strength, and power, all tax the anaerobic system. Which means you can only weight train with any specific goal, twice a week. For example, if you have speedwork on Monday and Thursday, and footwork on Tuesday and Friday, then you will weight train for power on Monday and Thursday, and train for strength on Tuesay and Friday. This allows you to recover in between sessions on Wednesday and the weekend. Or you might just want to focus on power. In that case you could still train power 4 times per week but break it up into lower and upper body days. If you do this, then alternating the loads isn't necessary, because you have more time to recover. Regardless of all I have said about developing power through maximum strength, you may still be a bit impatient and want to skip straight to the power phase. ...But with some potentially serious consequences. ...And, there is the possibility that having that weak base will cause injuries to muscles that were not ready for the strain of power training in the first place. Listen, would you rather be a powerful 405-lb squatter or a powerful 275-lb squatter? The former would drastically improve your play on the field. The latter can improve your skills--though not as much--but can also potentially injure you. Had to throw that warning in there, because I know there gonna be people out there looking for shortcuts. So prepare yourself correctly, and you will reap the benefit of safely becoming a stronger, faster, and more powerful athlete.